Bleak days have come to the Taldan city of Cassomir and nearby settlements, with a wave of depression and rage sparking horrific acts of violence. When retired adventurer Taergan Flinn doesn't show up to meet with his old companions, the PCs are called upon to investigate, leading them into a swirling maelstrom of horror and tragedy. Can the PCs unmask and confront the malevolent entity behind the madness and restore hope to a tortured land? 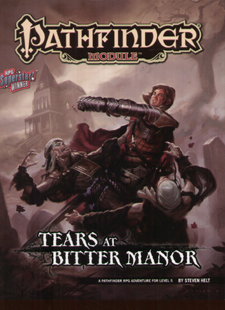 Tears at Bitter Manor is a deluxe super-adventure for 5th-level characters, and includes 64 action-packed pages filled with horrible haunts, eerie monsters, new magic items, a beautiful double-sided and full-colour poster map featuring a regional overview and an important miniatures-scale battleground and more! The winning entry of the 2013 RPG Superstar contest - in which unpublished authors compete for a chance to write a Pathfinder Module - Tears at Bitter Manor includes not only Steven Helt's winning adventure, but also a plethora of new monsters and magic items submitted by other contestants! Players can expect to reach 8th level by the time they complete this epic adventure and take on the otherworldly entity that thrives on humanity's despair!